It is with some delay that I decide to write about Aldo here. The reason is simply that after a house move I still have not been reconnected to the internet at home, and my absence from work for christmas holidays makes things even harder, and my presence online a sporadic break rather than a constant of motion. Aldo Menzione died a week ago. Those who have known him are surely very sad about this: besides the premature death, I think everybody liked him. Apart from being an excellent hands-on physicist, and among other things one of the true fathers of the silicon detector that helped CDF discover the top quark, Aldo was a remarkable human being, one who always spoke his mind and who impersonated -at least in my own perception- the typical behaviour of Italians of Tuscan origin: down-to-earth, speaking a fun language full of profanities, and with a big heart. He had the physique du role of the true "toscanaccio", too. Overweight, with a irregular beard and messy curly hair, never well-dressed, he constantly smoked. As Dante Amidei recollects, Aldo once let ashes from his cigarette fall on a silicon detector component while talking to him, and nonchalantly wiped it off with his finger, continuing to talk: "never bothered by detail, always looking at the big picture". Silicon detectors, which aim at measuring the passage of charged particles with micrometric precision, are delicate devices, usually kept in clean rooms. Despite being a colleague of his in CDF for twenty years, I did not interact with Aldo much -he was mainly a detector builder, while I am mainly a data analyst. However, I recall that we did discuss several times the extraction of a signal of Z boson decays in b-quark-enriched datasets that the Silicon Vertex Tracker started collecting at the start of Run II: Aldo was among the fathers of the new silicon detector, and his interest in the Z->bb decay was driven both by the physics -the decay is as close as one may get to the topology of Higgs boson decays to b-quark pairs- and by the wish to more generally study the trigger performance in the collection of b-quark jets. 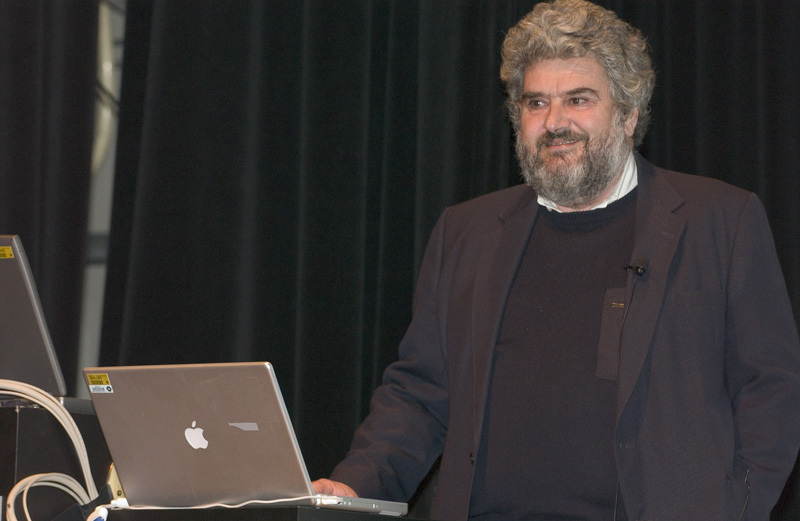 It is worth mentioning that in 2009, together with Luciano Ristori, Aldo won the Panofsky prize for their design and construction of the silicon vertex detector of CDF. I wrote about this here. "For their leading role in the establishment and use of precision silicon tracking detectors at hadron colliders, enabling broad advances in knowledge of the top quark, b-hadrons, and charm-hadrons." Indeed: and I would add Higgs physics to the list. If the LHC experiments nowadays sport hundred-square-meters silicon detectors in their cores, a bit of the merit goes to Aldo, who pioneered the development of these devices in the complex environment of hadron collisions. Rather than the animated discussions with him in the CDF trailers, however, I prefer remembering Aldo during a swim together in front of the island of La Caprara, during a boat trip at the "Frontier Detectors for Frontier Physics" conference in 2003. Maybe others who read this blog and met Aldo wish to leave here their own impressions ?